Add any 3 piece buckle set to your leather belt will really dress it up! Western sets and antique bronze color look great on our western and tooled leather belts. Each set comes with buckle, keeper and tip. We will place the buckle set on a belt when ordered together, because we use 10 oz leather we need to make some adjustments to the belts for the buckle sets to fit properly. 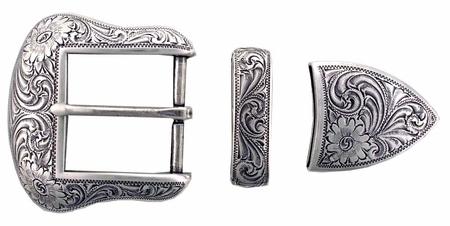 If you do not want the buckle set placed on the belt when ordered, please leave us a comment when checking out. If putting on a belt you already own you may need to have the tip end of your belt thinned for it to fit on the belt properly, it depends on thickness of the leather belt you own.